As I briefly mentioned in my last post, I had the bright idea to make myself a swimsuit for my upcoming trip to Las Vegas. 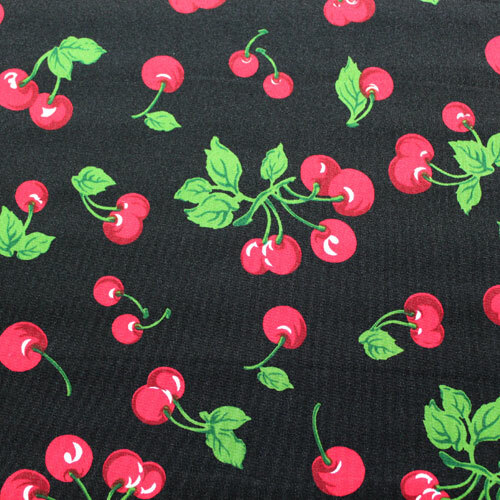 I decided to use McCall’s 5400, with some black and red cherry swimsuit fabric from Girl Charlee. I went for View E & H, which is the white tankini + bottoms seen in the above picture. Finding no finished garment measurements on the envelope (except for the coverup), I cut out the size that corresponded with my body measurements, figuring no one would put positive ease in a swimsuit pattern, right? Ha. Hahahaha. I made a muslin from an old t-shirt I made and hated, figuring I should use a stretchy fabric to get an idea of the fit. I tell you what, I am so glad I didn’t waste any of my adorable cherry fabric on this hot mess of a swimsuit. The fit was atrocious. 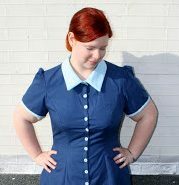 It was too big everywhere except the strap – and there are no photos because they would have been R rated – saggy, and completely and totally unflattering. I’ll be honest about my measurements – my bra size is a 36E, and I sincerely doubt this pattern for work for anyone above a C cup. Playing around with my muslin, I came to the rapid conclusion that even if I made it a lot smaller, there still wasn’t going to be anywhere near enough support to coax me to leave the house in it. No way, no how. I did some Googling around for a swimsuit pattern with underwire, during which I found a stunningly hilarious example. The hair, the high-waisted swimsuit bottoms, the pose – I laughed for about 5 minutes straight. I discovered there really isn’t a lot of choice. Jalie do, in fact, do a more modern swimsuit with a shelf bra, but it’s not really the cute look I was going for. You know that episode in the last season of Scrubs (the true last season, not season 9, which never should have existed) where Turk, JD and Dr. Cox are sitting on the beach, and their wives/girlfriends start walking up, and Elliott and Jordan look banging and then Carla comes along looking all frumpy? Yeah, that’s what this Jalie creation reminds me of. So I was starting to despair a little. I don’t want to break my pledge, because I know I have the practical skills to sew a swimsuit, at least, but drafting one is a bit beyond me at this stage. But, I think I might have come up with a solution to save the day that will be functional, supportive and cute! Stay tuned for the next installment of my swimsuit adventures!